Imagine this – you are hiking through a tropical rainforest. The sunlight warms your face as it peaks through the rich green foliage surrounding you. As you take a deep breath of fresh moist air, and the scent of ginger flowers fill your nose, the sounds of nature serenade you. Crickets and birds are chirping; a running stream gurgles on by. After a generous time, you’ve left all your worldly cares behind, and you happen upon a magnificent waterfall. A cascade of fresh spring water falls from far above a rocky facade and pounds onto the rocks below where a pristine pool has formed. The sunshine brilliantly spotlights this wonderful view! You sigh and take it all in. You sit alone facing this spectacle close enough to feel the raw energy of water falling onto the rocks, and the fresh mist gently spraying your cheeks and chest. You take a deep and satisfying breath in. As you exhale slowly, you feel invigorated and alert yet deeply relaxed and carefree. You settle into a deeply grateful meditation, sitting, gazing at this waterfall, for the simple pleasure of being immersed in nature. You sit for what seems like hours, losing all track of time and sense of self; you get into the flow, feeling at one and at peace with all that exists. Ahhhh...blissful meditation. This is what a perfect spontaneous meditation would feel like. It may be possible to re-create such a scene if you live close to a pristine rainforest. But for most of us, it’s almost impossible. Even if you are not a meditator or intentionally practicing mindfulness, such an experience in nature is a universal human desire. We all need to let go and release stress both physically and mentally. The refreshing elements we encounter in natural environments are the perfect antidote to stress to keep our selves balanced and maintain well-being overall. As a business owner and a teacher of yoga and meditation, I also need to maintain balance and wellbeing. I am fortunately one of those lucky ones who could pop out for a hike and happen upon a waterfall. However, it’s less of a regular practice than I’d like to admit. I rarely get out to hike as my schedule keeps me pinned down to a city-bound lifestyle, fighting traffic, working crazy hours, and doing my best to continue to grow as an entrepreneur. So, when I was introduced to the Biomat, I was thrilled. You see, I have spent over a decade of practicing yoga and meditation in natural environments, in the outdoors, under the sun, under a tree and often under the starry night sky. I have the experiential understanding of what it’s like to have a connection to the earth element and the fresh outdoor air. Having spent many years meditating in India, where most of our sessions were under a moonlit sky or the sun’s rays, I feel most at home when I’m able to be meditating outside. The Biomat experience is like bringing the outdoors and the best conditions nature could ever provide into my own home. It’s the technology that is a god-send to those of us with busy lives, who value nature and are looking to de- stress through deep relaxation or a mindfulness meditation practice. Meditation and deep relaxation... why? 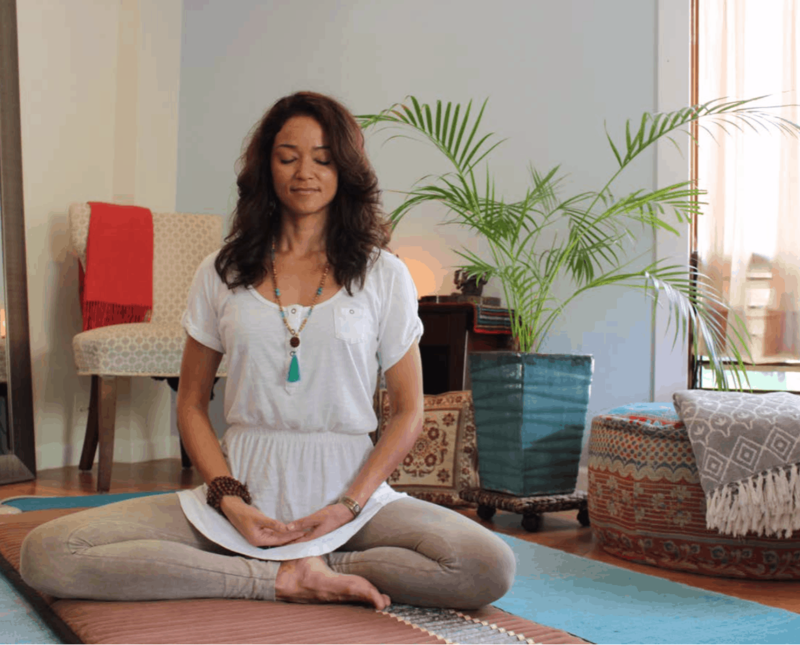 You may be asking yourself why meditate in the first place? Or, if you’re a regular meditator, why do it on a Biomat? Well, to address both questions, I’d first like to offer a simple definition of meditation. Meditation is the act of sitting or being still in an awake, aware and relaxed position. You cultivate stillness and quietude within yourself, to allow for more peace and calm within both your body and mind. Far from being a religious or spiritual practice, meditation can simply be considered “de- stressing,” “me time,” or even “down time.” Certainly, meditation is used by some in religious or spiritual practices, but it not necessary to be a spiritual or religious person to practice meditation. To an extent, meditating and mindfulness are interchangeable. However, meditating means more, so set aside more time to sit or take a relaxed position and be still and quiet. Mindfulness can refer to being conscious in a caring way of everything we do in our daily lives. For example, instead of letting a door slam behind you, you’d mindfully close the door so as it doesn’t slam. What’s fascinating is that by naturally finding the time to meditate on a regular basis, you will be more mindful in your daily life. Whether it be in relationships, at work, and anything else you do every day. It’s like your meditation practice spills over into living a mindful lifestyle. Meditation can also be practiced to simply de-stress, unclutter the mind, emotions and physical tensions of the body. Much like we clean our living space, we can use this silent time to clear and clean our mind and body of stress. Stress is not bad, but when it accumulates, just like clutter in a home, it can become detrimental and lead to conditions that are unhealthy in our body or mind. If meditation or mindfulness are not your cup of tea, then deep relaxation will be. Universally, we all need sleep and rest. Unlike sleep, deep relaxation is when you consciously relax the body in a lying down position. This is the rest our bodies and minds are craving. You can deeply relax anywhere from ten minutes to over an hour by lying down in a comfortable position and consciously relaxing your body and mind without falling asleep. It’s what I call the lazy man’s version of meditation. Whether you meditate or not, everyone should do it, every day. It’s not “taking a nap.” The point is you lay down awake and alert, but practice a deep relaxation, consciously letting go of tension of both the body and the mind especially as you exhale. The results are incredible — you feel as if you’d gotten the best night’s sleep ever and feel like you’ve hit the re-set button on yourself! Finally, while you lay down or sit upright in meditation, you can also practice positive visualization. This means simply imagining the positive outcomes you desire in life, as if they are occurring in that moment. It’s like watching a movie of yourself, living the life of your dreams in your mind’s eye. This is a nice way to keep the mind occupied while meditating or deeply relaxing. By channeling your thoughts in a positive direction, you combat negative thinking and relax your the body. The Biomat has assisted me with my meditation practice and deep relaxation, which I do between 10 to 45 minutes a day and sometimes several times a day. Sitting or lying on the Biomat for meditation is where both the focus and the relaxation that create the right conditions for an enjoyable and effective meditation really come into play. Just by having a Biomat reminds and encourages me to do my meditation and relaxation practices, which even I sometimes forget to do with my busy schedule. The Biomat’s physical presence itself has helped me continue and deepen a consistent meditation practice which I can attest to as the core of my health and vitality in life. 1. Infrared rays: destressing and healing the body from the warmth of the amethyst crystal rays. 2. Negative ions: for refreshing and invigorating energy produced from the Biomat®’s tourmaline or “TOCA” layer. 3. Clean energy: the EMF blocking function of the Biomat keeps me clear of these harmful frequencies. So remember the hiking scene through the jungle? Well the Biomat simulates something of nature in those regards. The infrared rays are like the warm healing sunlight for our sore and overworked muscles. The negative ions produced from the Biomat are akin to those you find in moist natural environments, like the beach, a forest and especially a waterfall. In the wilderness, there are no EMF’s, or minimal EMF’s, so we are free and clear in natural healing energy, as is recreated on the Biomat with its EMF blocking technology. Therefore, the Biomat mimics the conditions one would find if you were out in your choice of pristine nature, for our body and mind’s rejuvenation and healing. had more energy and that my sore muscles and fatigue were gone after using the Biomat. When I sit upright on the Biomat for my morning meditation, I feel a bright, upright, refreshing energy which I feel comes from the negative ions produced from the Biomat. I feel alert, yet relaxed, as if I am immersed in nature. I feel calmer. My mood is bright and happy. I’m naturally drawn to sit on the Biomat for meditation or relaxation because the amethyst crystals themselves are so beautiful and sourced from nature. They are appealing to me even when the Biomat is not turned on. My meditations feel more focused and alert on the Biomat. I feel that being on the Biomat helps me to feel grounded in my meditation practice. It’s as if I were sitting under a beautiful tree on the grass meditating outside. Finally, I rest easy knowing that the harmful EMF’s are being blocked while I sit or lay on the Biomat. EMF’s are not the body’s best friend, but they are a byproduct of electronics and modern technology and are unfortunately a part of our daily lives. The more we can minimize them, the better off we are. Thankfully the Biomat minimizes EMF’s so you can feel safe and assured you’re in a clean energy field while sitting or lying on the Biomat. Technology that lends to grounding and mindfulness...is the Biomat. Whether you sit and meditate, lie down to de-stress or practice positive visualization, the Biomat is a safe and effective way to enhance your stillness and calming practices. The Biomat is truly state of the art technology that helps us to release stress and find peace and calm from within. For me, it’s the perfect pairing and a great enhancement to mediation practice which continues to evolve and grow over my life. You see, I’m no different than anyone else in modern society. Even though I’m a yoga and meditation teacher and practitioner, I too have fallen prey to the notion that being continuously busy and “on” are signs of achievement. I have to actively de-stress and go against the grain to maintain my health and balance in life. We’ve been told that being busy is the social norm and that it’s a badge of honor and a sign of success. However, times are changing, and we are starting to recognize that we are not machines; nature is our source for healing and recharging; and real burn out ensues when we don’t take that time to recharge. Modern culture, and its message to continue to be busy at the cost of our health, is no longer panning out in our own personal experience. We feel it in our achy bones, our hectic minds, and our fatigued bodies. We all need deep rest, rejuvenation and healing from what our busy modern lives require of us. Life can be lived with purpose and meaning without burnout and even more effectively when we take the time necessary to recharge and love our bodies and minds back into peaceful health and balance. You can maintain and bolster your health and wellbeing through simple rest, or with the practice of meditation and stillness on the Biomat which can exponentially grant you what nature would have for you-- health, wellbeing and a peaceful calm in our bodies and minds. I love using the Biomat daily as a literal foundation upon which I now practice meditation and deep relaxation techniques. I encourage you to find nature in your own indoor space by using a Biomat to meditate and relax on each day – you deserve it! Imagine as you sit or lie on your Biomat, you are taking that first step onto that beautiful rainforest trail that leads you to the magnificent waterfall ahead! Breathe deeply, relax and enjoy!